High Vacuum Diffusion pumping system with 6 inch DP and 21 m3/hr backing pump capable of giving vacuum of the order of 1x10(-6) mbar is made ready for cryogenic vessel evacuation. 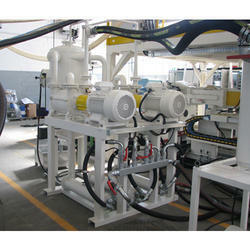 Vacuum system envisages conveying of dry fly ash from ash hoppers by vacuum pumpsand collection in ISH. Each vacuum pump, dedicated to a stream, can convey both coarse and fine ash. TCS and TCD series of Centralized Vacuum Systems are for medical/surgical or general industrial applications that require controllable operating vacuum levels from 1mbar to 850mbar (absolute). C. DOCTOR INDIA PRIVATE LTD. The M200 system enables the transformation of self-powered cars with carburettor engine or for that matter any such vehicles with injection engine without catalyst in a modern and secure way. It is also equipped with a car safety system which is inbuilt. - Designed for continuous operation in accordance to EN 737-3 standards. To meet the precise demands of clients, we offer a wide range of Central Vacuum System. These are extensively demanded by clients owing to its ultimate pressure, robust design and compact size. Our systems are acclaimed for their consistent performance. Besides, we render only quality checked devices at our clients’ end.